The physical yoga that the Western world has come to know is called Hatha yoga. Indeed there are many other yogas that bear no physical resemblance to the yoga we practice in class, such as Bhakti yoga (yoga of devotion), Gnane yoga (the search for wisdom), Raja yoga (controlling the mind), Laya yoga etc. 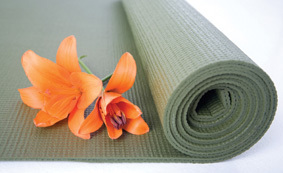 With Hatha yoga, the muscular-skeletal system is worked in a total and organised way. The postures are performed in sequences or chains that systematically and specifically work on muscle groups, joints, ligaments and tendons. Hatha yoga is a mind and body discipline. It is important to understand that you will experience both physical and mental changes as a result of your practice. Yoga affects the whole being: At the physical level, the effects are an overall improvement of the organ systems of the body, increased muscular strength, flexibility and postural improvement; at the mental level there is a decrease in anxiety, improved emotional balance and improved intellectual functioning. In the classes, a complete and different chain is followed each week. In yoga there is a major emphasis placed on the flow of energy in the body. This is not the common energy of chemical metabolism, but is the subtle energy, known in yoga as prana that runs in meridians or nadis. As one advances and becomes more sensitive to subtle physiological states, this energy flow becomes perceptible to the practitioner. The instruction given in the class by the teacher should allow you to move into the postures as completely as you can without undue strain and, while holding, you relax, using both the mind and the breath to deepen into the posture. The experience of heightened consciousness is for those whose commitment is total – yoga has the power to bring about transformation of consciousness and consequently the ability to bring about that transformation of consciousness in others. It is truly a “path with a heart”. Everything you need to know should be described by your teacher as you do the class. In the same way the science has developed a method for investigating the nature of the physical or outer world, yoga has developed a system of techniques for the investigation of consciousness of the inner world. It is a truly holistic approach that integrates the body, mind and higher potentials. Hatha Yoga however is the basis of all the physical yoga that exists in today’s modern world and all of the styles referred to and taught at the ISHTA School of Yoga & Health have their roots in pure Hatha Yoga.